$35.00 In stock. Order in the next 18 hours, 2 minutes and it will go out today! In stock. Order in the next 18 hours, 2 minutes and it will go out today! 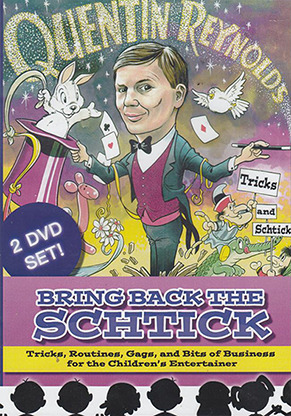 "If you want to know what a professional children’s entertainer looks like, acts like and thinks like then this double DVD set should surely be an essential resource.” That’s what Richard McDougall said about Quentin Reynolds Bring Back The Schtick. Over 4 hours of performances, explanations, interviews and kids show magic history is jammed into these well-produced DVDs. Over the past 40 years, Quentin Reynolds has probably performed more kids shows in the United Kingdom than any other magician. In these DVDs he shares his best routines from shows designed for three different age groups! You’ll see live performances in front of British school children shot with three cameras. The children's faces prove how effective his presentations are. Silver Sceptre – A magic silver stick comes to life as it rises and slithers out of its case. Quentin includes tips on how to get better reactions from this classic effect. AmazeKids Danny Orleans immediately ordered one after watching this video. Fishing Competition – A competitive game for parties that adds 10 minutes of laughter and excitement to your show. Chinese Rings – This bonus routine has a number of gags, moves and suggestions that you’ve never seen before. If you do any kind of Linking Ring Routine, you have to see Quentin’s handling. On Disc 2 you’ll enjoy Quentin’s interview as we learn about his life in magic, plus you join him on a journey to yesteryear as he looks at children’s entertainers in the UK and their legacy of excellent magical effects. He even demonstrates many of the original props from his collection! Milbourne Christopher’s Forgetful Freddie - a new look at a classic including archived footage of Quentin performing it in the 1980s! Whether you’re a full time or part-time kids show pro, or someone that wants to learn how to effectively perform magic for children for fun or to boost your income, you’ll learn great routines and many of the real secrets to doing kid shows when you get Quentin Reynolds’ Bring Back the Schtick.